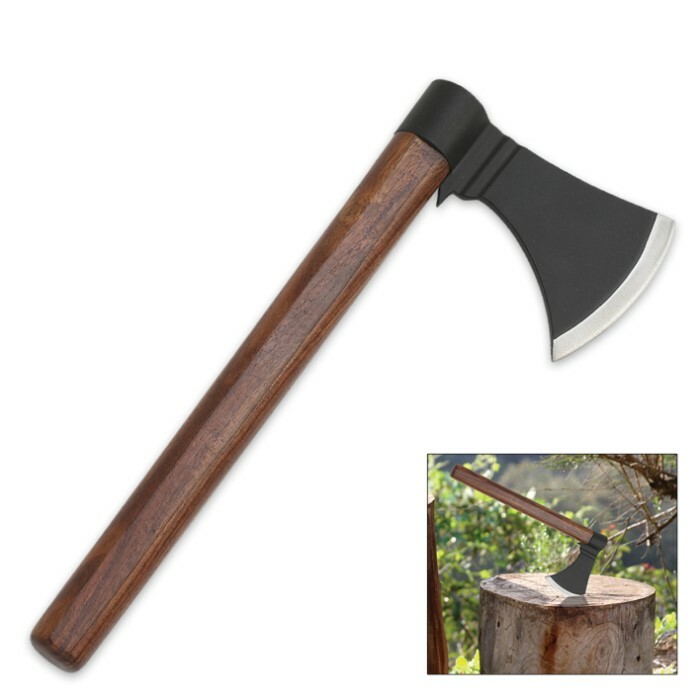 Wood Handled Throwing Hatchet - Axe | BUDK.com - Knives & Swords At The Lowest Prices! 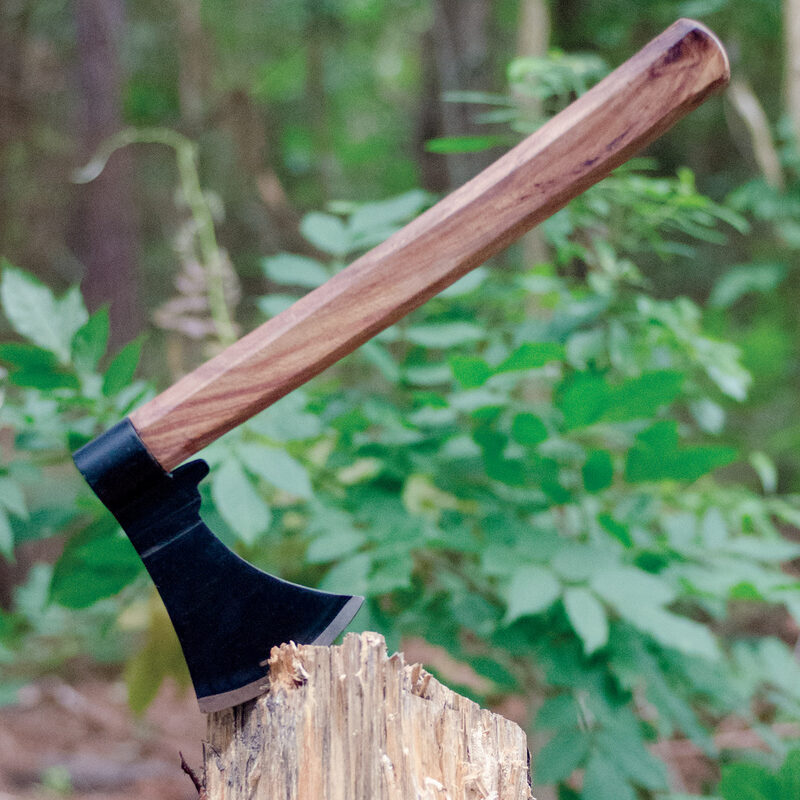 Tackle the age-old tradition of axe-throwing with this classic throwing hatchet! It has a 3 1/2" stainless steel axe head and a strong hardwood handle. This throwing hatchet has great balance so that it's easy to hit your target. If you want to really master axe-throwing, this is the throwing hatchet for you! Nice balance. I ordered 3, Heads were a little loose so epoxy took care of that. They throw well. This is not recommended for seriously hard work, it's not made to throw in to a tree but, for something similar to a dart board,and thrown litely not for Killin zombies or serious self-defense. Better to make a wall decor or something to look at. This is a throwing ax folks. The ax head is supposed to come loose to keep the handle from breaking. It is not supposed to be sharp for cutting since it is designed to be thrown at wooden targets. It works fine when used for what it was designed for. Poor excuse of a ax when I got it, but the fix is fairly easy, cut the nub off ,cut the alum. ring out, grind the end of handle down to a tight fit in the head, you'll have a shoulder on the handle, drill a hole through the center of head, put a 3 inch wood screw in in hole you drilled, screw in tight. I've been throwing since and the head not only stayed on it stayed tight on handle, it really throws good, it surprised me how good. The axe head is made excellent. the handle is also good, however it was poorly put together. As all the other reviews say the handle broke off after three throws. The handle broke off the head with the first throw. 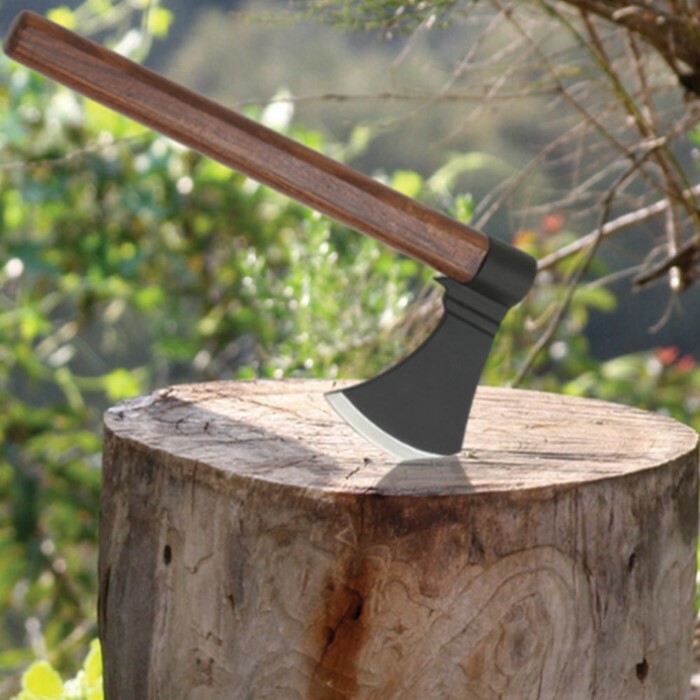 The wooden part that goes inside the ax handle is very thin and short and can't withstand the impact of the throw. It was complete disappointment for my son when he got to play with his birthday gift. And a waste of time and money for me. Response: We're sorry you weren't satisfied with your purchase, we strive to meet our customers' expectations with every purchase. We will be more than happy to have the replaced for you if you call our customer service department at 800-735-3326. Thanks again and sorry for this inconvenience. It looks like a competitive throwing axe, but like the other comments, it lasted about 3 throws. It loosens on the first throw, became worse the second and broke off the third. Some alterations makes it a very poor thrower.